We are delighted to announce that we’ve achieved the highest accolade from the BRC! We’ve been accredited with AA status meaning that we have achieved success in all areas of our operations. It’s the result of dedication and determination and we are immensely proud of our team effort. 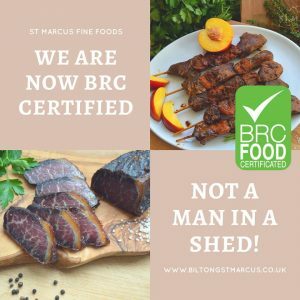 The St Marcus Fine Foods team commits to maintaining the highest of standards. Since we received the certification at the end of last year, it’s been the company’s mission to manufacture outstanding products. This latest accolade, the highest audit rating possible, shows the professionalism of our operations products and overall running of the business. This enables customers and third parties to evaluate us against a uniform, globally recognized standard, transferable across so many industries. This award shows our commitment to customers through the service levels we offer. It also highlights our ethics and therefore, sets us apart from other similar manufacturers. Industry experts have developed BRC as a global standard accreditation. This is to secure the attainment and maintenance of high standards for product safety. This includes operational management, supply chain for organisations involved in the storage and distribution, wholesale activities and manufacturing of food products. Over the coming months we will strive to maintain this rating and have plans in place to ensure the company continues to develop outstanding products, and most of all, delicious Saffa products.